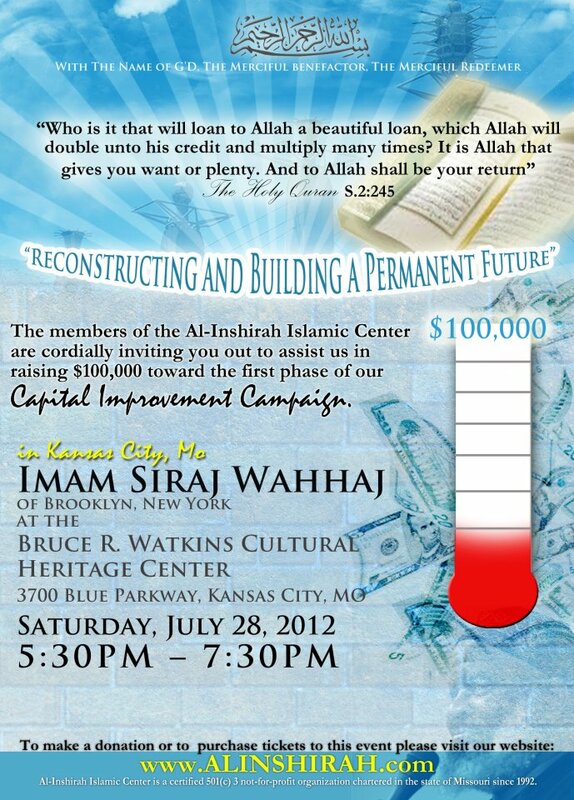 Al-Inshirah Islamic Center. This is a noble cause (Jihad), striving in the Way of ALLAH (swt). specifically helped Islamic Centers associated with the leadership of Imam Warith Deen Mohammed, as well as helping the Sister Clara Muhammad Schools. May ALLAH (swt) bless our striving, our work, and our sacrifices to please HIM! Donations are being accepted through PayPal. Please visit the website at www.ALINSHIRAH.com and click on Campaign for more information on how to donate online. If you have a PayPal account you can send a payment to alinshirahkc@gmail.com. A receipt will be mailed. Al Inshirah Islamic Center is a 501c3.